Definition at line 18 of file IORequestor.h. 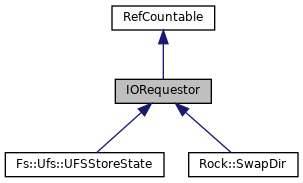 Implemented in Rock::SwapDir, and Fs::Ufs::UFSStoreState. Referenced by MmappedFile::close(), BlockingFile::close(), DiskThreadsDiskFile::close(), IpcIoFile::close(), and DiskdFile::closeDone(). Referenced by DiskdFile::notifyClient(), MmappedFile::open(), BlockingFile::open(), IpcIoFile::open(), IpcIoFile::openCompleted(), and DiskThreadsDiskFile::openDone().